This has been the summer of unbearable heat in Sweden, and we have had record numbers of fires all over the country (we even had to be assisted by firefighters from Poland and other countries to keep up). In all honesty, it has been a bit of a nightmare. 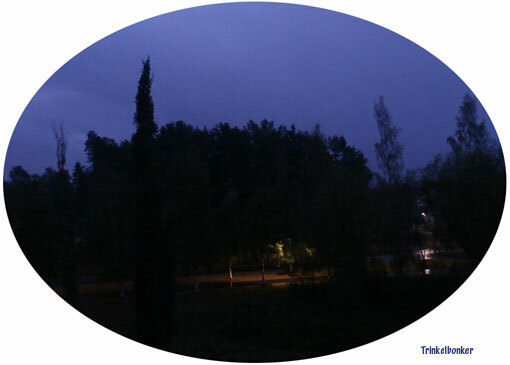 But tonight the rain came and I took this snapshot from my balcony a few minutes ago because I was so happy to see it. Apparently it will be raining quite a lot in the next few days. That is good news to the hundreds of firefighters and volunteers that are out there right now in this neck of the woods. I will be honest here. This heat had me worrying about the safety of my new home in the countryside. There was a fire on a nearby mountain a few days ago so you start to think about these things. And when most lawns are more yellow than green, you have got a problem. This has been a very strange summer.